In the wake of his emblematic Create Yourself in the World, Recreate the World (2011) for the French Embassy in Beijing, artist Jean-Bernard M�tais was approached in January 2012 by various local government bodies in China for artworks to be included in their urban development programs. He was given carte blanche for sites in the cities of Jurong, Shangra, Nanjing (Nankin), Tianjin, Taywan, and Wuhan. A number of his proposals have already been accepted and some of the works are now in production. Sensorial Room - Jurong 2142 (in progress) is a double-headed, semi-transparent work set on a reflecting pool in a 25-hectare park in the city of Jurong. Jurong is known to historians and Sinologists as the home of one of the world's largest Taoist archaeological sites. Drawing on a vision of interlocking solids and voids, this "interior/exterior" project evokes an oscillation between the stationary and the moving that ties in with the harmonious male/female principle of the Taoist yin and yang. Media: cast bronze and steel, light. Height 11 metres, diameter 9 metres, length 26 metres. The site is known as the "Silk Dragon" and the work, commissioned by site proprietor and contemporary art patron Michel Ji, has its roots in this allusion. Jean-Bernard M�tais has come up with a mirror-finish stainless steel vortex that seems to aspirate the deformed reflection of passers-by into the sculpture's spiral movement, imbuing the "dragon" with the mysteriously symbolic, sometimes disturbing power that fuels the collective imagination. Height 9 metres, length 13 metres. On a former salt marsh on the edge of the ocean now stands part of China's fifth-largest iTech city, built in less than 30 years. To preserve something of the memory of the site, Jean-Bernard M�tais has let thread-like aquatic forms such as seaweed inspire suggestions of marine life. Composed of fin-shapes attached to a mast 68 metres high, the sculpture stands out boldly against this new cityscape. Most strikingly, this is not a static work: in perpetual movement, it interacts with external forces like the wind. The fins are activated by a system of electromagnets which simultaneously attract and repel each other. The work is lit up at night by dynamos that store its dynamic energy. Built on a vast decontaminated industrial site, the city of Shangra includes a remarkable nature park centred on a 200-hectare lake. 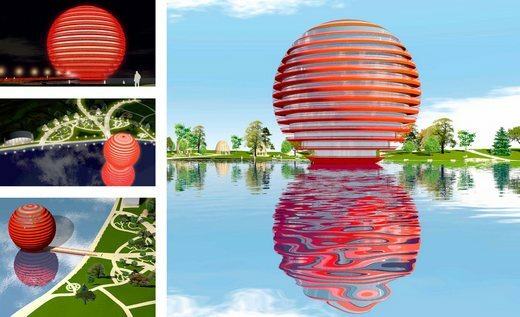 Jean-Bernard M�tais's idea for the lake is a work that will function as both icon and repository: its core concept is a monumentally spherical "archisculpture" that connects with the setting and the climate while also housing an ecology museum devoted to the site's history. Rising and falling in intensity from orange to bright red, the lighting is orchestrated to suggest the rhythm of a heartbeat. Inside the sphere an array of climatic data sensors feed into software providing real-time information on wind speed, storms, earthquakes, eclipses of the moon and earth, solar flares and other natural phenomena. Taking as his starting point an existing river which can be diverted to meet planning needs, Jean-Bernard M�tais has devised a walking circuit whose underlying inspiration is the night sky and the Milky Way. The constructions dotting the waterway?they suggest fantastic celestial and aquatic creatures?are activated by water pressure accumulated upstream and released at irregular intervals. This brings the structures to life, generating a playfully poetic tumult in this new, 15-hectare pedestrian park. Planned for a 45-hectare park Jean-Bernard M�tais has been working on since 2012, this piece was inspired by the high winds that sweep its site. Arranged in an ellipse 80 metres long, 1888 rods varying in height from 1.8 to 4.8 metres work like aeolian flutes, producing an almost continuous warbling. At night an interactive system of anemometers and optical fibres brings the luminous tips of the rods to life in a wonderland of changing colours.